Remember when those two satellites collided the other day? 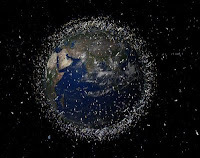 Seems that they'll be the space junk gift that keeps on giving, as their 800-km debris orbiting field could hamper all future space launches. "Future launches will have to be adjusted with regard to the fact that the debris [from the collision] has spread over an 800-km area and will gather at a common orbit in 5-6 years," said Alexander Stepanov, director of the Pulkovo Observatory in St. Petersburg. According to NASA this massive cloud of human failure joins the 19,000 other objects that currently pollute the low and high orbit space around the planet. As we reported last week, the Hubble Space Telescope is already in danger. On a related note, anyone who criticized the Pixar movie Wall-E for "liberal bias" or for "unfairly" depicting future humans as slovenly creatures that polluted Earth and space to the point where it was uninhabitable is a dufus. And so ends my personal rant for the day.